BALTIMORE – Because he has been here before, and because he might be the coolest human being in the world, Derek Jeter tends not to approach playoff games that are tied in the ninth inning with the white-knuckle anxiety of an average person. Take, for example, the AL Division Series opener here on Sunday night, a pearl of a ballgame. Nobody dared blink. Except Derek Jeter, of course, because these are the Yankees, and there is a fundamental belief Derek Jeter never will abandon: The Yankees are going to win. He has a fistful of ostentatious rings that support his worldview, so not only did he blink, he went somewhere else entirely when Russell Martin's go-ahead home run in the ninth jump-started a blowout inning in the Yankees' 7-2 victory against the Baltimore Orioles. "I was in the bathroom," Jeter said. Hold the old prostate jokes and think about what that says: the trust, the conviction, the swagger – that these Orioles, who had pushed the Yankees all season long and were again doing it in Game 1 of the best-of-five series, did not warrant his full attention in the ninth inning of a tied playoff game. It is everywhere with the Yankees, woven into their pinstripes if not embedded in their DNA. Even if they're not officially the kings – even if they've won but a single championship in the past decade – they strut around acting like it, and there's something very powerful in that. Whether it scares the Orioles like it has other teams – Seattle and Minnesota spooked easy over the Yankees' great run since 1996 – remains to be seen as the rest of this series develops. Still, what happened at an amped-up, ready-to-celebrate Camden Yards on Sunday did not exactly portend something good. Gone is the pseudo-home field advantage Baltimore held with the series' first two games at home. The Orioles now must win at least two games at Yankee Stadium, where New York sports the best home record in baseball. And they need to start that resurrection less than 24 hours after watching their impermeable closer turn the pitcher's mound into a fallout shelter over the course of 17 pitches. Patient all night, the Yankees took the hacktastic approach with Jim Johnson. On the third pitch of the top of the ninth, Martin hit a monster shot to left field. Raul Ibanez singled to left. 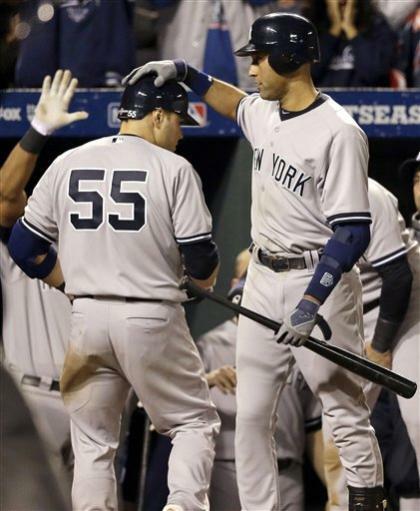 Jeter, no longer burdened by nature, moved him to third on a perfect hit-and-run single. Ichiro banged a run-scoring single, and then Robinson Cano shook off four hitless at-bats with a double that brought both of them home. Fans streamed out by the thousands, the ugliness mirroring the last time these two played in the postseason 16 years ago. "That," Cano said, "was a great inning." And not just because of the crooked number the Yankees threw up on the scoreboard, a five-spot. It was because Yankees manager Joe Girardi had the temerity to call a hit-and-run with Ibanez, nobody's idea of a good runner, ready to get thrown out had Jeter swung and missed. It was because Ichiro, so bored in Seattle, is still slapping singles as though he's in his 20s and not, like Jeter, 38. That's 76 years atop the lineup card every day, 76 years of that Yankee attitude, a superiority Ichiro adopted very quickly. He fit right in because even as his skills have diminished, he still believes himself to be the best, much like the team for which he plays. "We've got our two magicians up at the top," Yankees outfielder Nick Swisher said, "and then we've got nothing but thunder all the way down." Even if Jeter and Ichiro are more like the illusionists with card tricks than ones who can teleport, their presence in such situations reassures. The Yankees had plenty of time to kill during a nearly 2 ½-hour rain delay before Game 1, and they spent it watching football and comparing fantasy teams instead of letting nerves ensnare them. "We're just in a good spot," Swisher said. "We're not stressing about nothing. It's nice and chill in here. Even before the game, there's not a lot of stress." Granted, it helps with CC Sabathia on the mound. At 32, he remains the sort of monster who personifies their pitching staff like Jeter does their everyday players. He came to New York because the Steinbrenner family was willing to pay him $161 million and offer him a playoff spot every season. That's what this means to the Yankees, to Sabathia, to everyone in the organization – a 28th championship, seizing an opportunity when there's no clear-cut best team, riding the magicians and thunder and other such hyperbole into which they buy because they're the Yankees, dammit. Even Girardi leaving Sabathia in to pitch the ninth inning was something of a statement. While he didn't finish the game – Lew Ford's double to right-center left him one out shy – Sabathia threw 120 pitches, the workhorse's maximum threshold in most cases, and put out a memo to anyone interested that said: "Come at the king, you'd best not miss." It's a line made famous here, actually, on "The Wire," by a character named Omar, a stone-cold killer. In this game – and, let's be honest, in this division, in the AL and in all of baseball – the Yankees are kings and assassins. They are baseball's jewel franchise, can pay for whoever they want, own a massive TV network and play in a billion-dollar stadium. There is royalty in their excellence and their hubris, in their mighty successes and their mightier failures, in the tableau of Yankeedom that makes their fans the best and their detractors the most vociferous. "We ain't the kings," Sabathia said. "The Cardinals are. They won the last championship." Sabathia wants to parse it like that because he's something of a diplomat. Fine. Just know that for eight innings, the Orioles matched the Yankees. Starter Jason Hammel acted the tough guy, almost putting a ball in Martin's earhole. And then the ninth rolled around and the monster closer who allowed one run in the last two months gave up five. The Orioles came at the king. They missed. And it's easy to wonder if, much like Derek Jeter's business when it happened, their season is headed down the drain because of it.